Standing 12 inches tall and weighing four pounds, Mondo’s new line of 1/6 scale Masters of the Universe toys are just as impressive now as the originals were back when I was a kid. If you have $160 to spare, you can have the power. When He-Man and friends first hit the toy scene back in the 1980s, they were some of the biggest figures going. The market until then was dominated by skinny Star Wars and G.I. Joe size figures, which were under four inches. Then He-Man showed up, six inches tall and brimming with muscle. He was imposing and incredible. 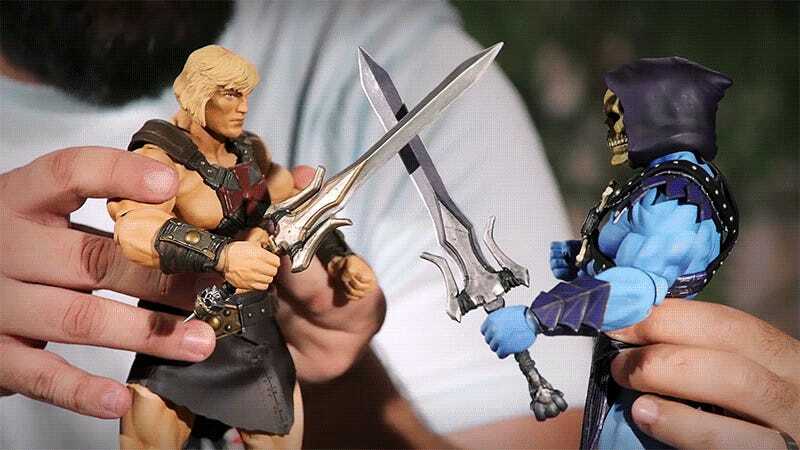 In our tiny kid hands, the Masters of the Universe toys felt massive. Now that our hands are much bigger, we need bigger figures, like this one. Mondo’s He-Man, due out in early 2019 for $160, is a foot-tall hero featuring more than 30 points of articulation, far more than the original toy line. He’s got cloth accents on his outfit and a ton of weapons and accessories. He’s even got guns. With all the swordplay, we often forget He-Man’s world was part fantasy, part high-tech, and guns were a thing. Ah! What happened to his face? Don’t worry, that’s the special “classic” face sculpt that comes with the figure, so fans dedicated to the old school designs can have their beefcake and be revolted by its horrible mug too. Here’s everything that He-Man comes with, plus a special treat that’s only available in the Mondo Exclusive edition, an extra face for Skeletor based on his early comic appearances. Dude, he even comes with Burbie. Of course that means you’ll need to shell out an additional $160 to get Skeletor as well, but if you’ve already spent that much on He-Man there’s no point in holding back. That’s one creepy looking dude right there. And buying two of these just makes it that much easier to justify upcoming figures like Merman and Man-At-Arms. And after that, you’re pretty much doomed. You’ll die alone, surrounded by really cool 12-inch Masters of the Universe figures. And it all starts with He-Man. Check out the gallery below for more of the muscle-bound meathead, or hit up Mondo for more info.